Marlborough. His Life and Times - Sir Winston Spencer Churchill 1933-1939 - George G. Harrap & Co. Ltd., London - First Editions	Winston Churchill's authoritative and brilliantly written monumental biography of John Churchill, First Duke of Marlborough (1650-1722), Winston’s great ancestor, general and statesman, and one of the greatest military commanders in history. 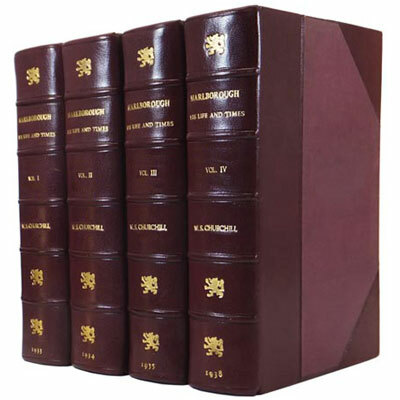 Four first editions finely bound in burgundy morocco, and illustrated with many photogravures, maps and plans and facsimiles of letters and documents. Marlborough crushed the rebellion of the Duke of Monmouth under James II. During the Glorious Revolution he supported William III against James II but later fell out of favour with the new king. Marlborough was created duke in 1702, and was involved in many victories in the war of the Spanish Succession, including Blenheim (the ancestral home took its name thereafter) 1704, Ramillies 1706, Oudenarde 1708, and Malplaquet 1709. His wife, Sarah Churchill was a favourite of Queen Anne and a remarkable woman who wielded great influence at court until a quarrel with the Queen in 1705. She supervised the building of Blenheim Palace after the death of her husband. Reference: Woods, Bibliography of the Works of Sir Winston Churchill A40(a). Langworth, A Connoisseur’s Guide to the Books of Sir Winston Churchill 166.